You can Ritual Summon this card with "Black Illusion Ritual". Once per turn: You can target 1 monster your opponent controls; equip that target to this card. (max. 1). This card's ATK/DEF become equal..
(Quick Effect): You can discard this card, then target 1 Effect Monster your opponent controls; equip that target to an "Eyes Restrict" Fusion Monster or "Relinquished" you control, as if it were equi.. If a face-up "Eyes Restrict" Fusion Monster or "Relinquished" you control is destroyed by battle or card effect: You can Special Summon this card from the GY (if it was there when the monster was dest..
"Relinquished" + 1 Effect Monster. Once per turn, when your opponent activates a monster effect (Quick Effect): You can target 1 Effect Monster your opponent controls or in their GY; equip that target..
Fusion Summon 1 "Eyes Restrict" Fusion Monster from your Extra Deck, by banishing Fusion Materials from your hand, field, and/or GY. During your Main Phase: You can banish this card from your GY, then..
"Relinquished" + "Thousand-Eyes Idol". Other monsters on the field cannot change their battle positions or attack. Once per turn: You can target 1 monster your opponent controls; equip that target to ..
(Quick Effect): You can target 1 face-up monster on the field; equip this card from your hand to that target. The equipped monster becomes an Insect monster, cannot attack Insect monsters, also its ef.. Cannot be Normal Summoned/Set. Must be Special Summoned by a card effect. If another Insect monster is on the field, your opponent cannot target Insect monsters you control with card effects, also the.. Tribute 1 Insect monster from either field equipped with an Equip Card, and if you do, Special Summon 1 Insect monster from your Deck, ignoring its Summoning conditions. During your Main Phase: You ca..
Target 1 Insect monster you control; equip this card to it. While you control the equipped monster, your opponent's monsters cannot attack Insect monsters, except the equipped monster. While this card..
Once per turn: You can target 1 DARK Machine monster you control and 1 face-up card your opponent controls; destroy them. If a monster you control that was originally a DARK Machine destroys an oppone.. If a face-up DARK Machine monster(s) you control is destroyed by battle or card effect: You can Special Summon this card from your hand. Once per turn, during the Battle Phase (Quick Effect): You can .. The first time each DARK Machine monster you control would be destroyed by battle each turn, it is not destroyed, and if you took battle damage from that battle, it gains that much ATK after damage ca..
Once per turn, if an activated card effect tosses coins, immediately after it resolves, apply the following effect(s), depending on the number of heads. :- 1+: Inflict 500 damage to your opponent. :- .. If this face-down Defense Position card was attacked by an opponent's monster, before damage calculation: Equip this card to the attacking monster. Then, during your opponent's next Standby Phase: Des..
"VWXYZ-Dragon Catapult Cannon" + "Armed Dragon LV7". Must first be Special Summoned (from your Extra Deck) during a Duel you Special Summoned both cards, by banishing the above cards from your field a.. 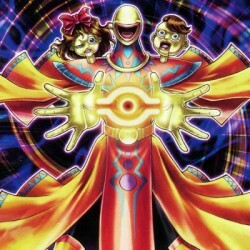 Reveal 1 LIGHT Machine Fusion Monster in your Extra Deck and banish any number of "Ojama" monsters from your hand, face-up field, and/or GY; Special Summon Fusion Materials with different names whose .. Send 1 "Ojama" card from your hand or face-up from your field to the GY; add to your hand 1 "Ojama" monster with a different name and 1 "Armed Dragon" monster from your Deck and/or GY , then, immediat.. If an "Armed Dragon" monster(s) and/or LIGHT Machine Fusion Monster(s) you control would be destroyed by battle or card effect, you can banish 1 "Ojama" card from your hand, face-up field, or GY inste..
You can send 1 monster from your hand to the Graveyard to target 1 face-up monster your opponent controls with ATK less than or equal to the sent monster's ATK; destroy that target. During the End Pha.. Cannot be Normal Summoned/Set. Must be Special Summoned by "Armed Dragon LV5", and cannot be Special Summoned by other ways. You can send 1 monster from your hand to the Graveyard; destroy all face-up..